The annual Corvettes at Carlisle event features more than 5,000 Corvettes representing all generations of Americas classic sports car. After exploring one of the largest and most fun-filled Corvette events in the world, stay at the Bridgeview Bed and Breakfast. Bridgeview is tucked away in a peaceful country-like setting with an up close view of the famous Susquehanna River and 100 plus year old Rockville Bridge. Located approx. 30 minutes from the Carlisle Fairgrounds. Our indoor Sitting Room provides a relaxing atmosphere to observe the lazy river and train activity, while the mountains provide a majestic back drop for any season. Email or visit us on the web for current prices and room availability. Planning on attending the Pennsylvania Farm Show 2011 in January? Make the Bridgeview Bed and Breakfast your lodging destination, located 7.1 miles or 14 minutes taking I 81 S from the Harrisburg Farm Show Complex. Escape the cities hustle and bustle in our private country setting, surrounded by the famous Susquehanna River and the 100 plus year old Rockville Bridge. Our wrap around deck provides an easy angle of the train activity for those impossible shots. Our guests have full access to our rear oversized deck, covered front porch and shaded patio, all ideal for anyone to find total comfort in their stay. The indoor Sitting Room, surrounded by large picture windows, is a favorite of many! So please, call or click today!! Kennywood is located on Rt. 837 in West Mifflin, PA just minutes from (about 12 miles southeast of) the downtown Pittsburgh area. Check out the NEW Sky Rocket, 6 roller coasters, 3 water rides, 10 classic rides, 3 dark rides, 14 kiddie land, 2011 shows and dining area. A souvenirs shop includes books, videos, collectibles, and apparel, for those memories to go! While staying at the Bridgeview Bed and Breakfast discover another reason why Pennsylvania is famous. Relax on the over sized wrap around deck and patio to observe the world famous Susquehanna River and the 100 plus year old stone arch bridge, the Rockville Bridge. Get those impossible shots of the roaring steam engines! Call or click today! Why Pennsylvania is famous. Frank Llloyd Wright. Frank Lloyd Wright (born Frank Lincoln Wright, June 8, 1867 thru April 9, 1959) was an American architect, interior designer, writer and educator, who designed more than 1,000 projects, which resulted in more than 500 completed works. Wright promoted organic architecture exemplified by Fallingwater, was a leader of the Prairie School movement of architecture (exemplified by the Robie House, the Westcott House, and the Darwin D. Martin House, and developed the concept of the Usonian home exemplified by the Rosenbaum House. His work includes original and innovative examples of many different building types, including offices, churches, schools, skyscrapers, hotels, and museums. Wright also often designed many of the interior elements of his buildings, such as the furniture and glass. Wright authored 20 books and many articles, and was a popular lecturer in the United States and in Europe. His colorful personal life often made headlines, most notably for the 1914 fire and murders at his studio. Already well-known during his lifetime, Wright was recognized in 1991 by the American Institute of Architects as the greatest American architect of all time. Located 7 miles from Falling Water is another one of Frank Lloyd Wright home designs, called Kentucky Knob. When staying at the Bridgeview Bed and Breakfast you are able to take in the beauty of why Pennsylvania has become so famous. 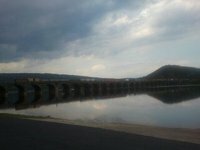 The world famous Susquehanna River and 100 plus year old stone arch, Rockville Bridge. Our back deck and patio provides an up close view of both. Kick back and relax to the steady beat of the roaring steam engines, and get those picture perfect shots.